The group was constituted as the 61st Transport Group on 20 Nov 1940. It was activated on 1 Dec 1940. 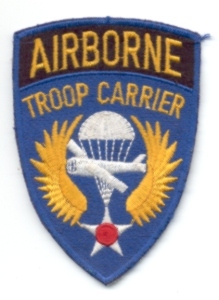 In Jul 1942 it was redesignated 61st Troop Carrier Group. The 61st used C-47's to prepare for operations with Twelfth AF. It moved to North Africa in May 1943 and, after a period of special training, began operations on the night of 9 Jul by dropping paratroops near Gela during the invasion of Sicily. The group received a DUC for completing a reinforcement mission two nights later when the group sustained heavy attack by ground and naval forces. In Aug-Sep 1943 the 6st moved to Sicily to play it's role in the in the invasion of Italy. During the invasion of Italy, the 61st dropped paratroops north of Agropoli on 13 Sep 1943 and flew a reinforcement mission to the same area on 14 Sep. Also transported cargo and evacuated patients while in the Mediterranean theater. The men of the 61st TCG pose in front of the X5, the aircraft that was commanded by LtCol. Marcus O. Owens Jr.
Picture courtesy, Bernie Semler, his farther is one of the mecanics in the picture, backrow, fifth from the left.